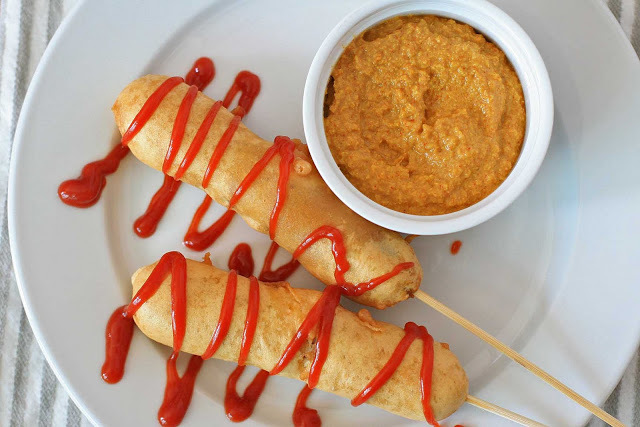 Is it weird that I’m sort of embarrassed that I’ve never seen deep fried beer battered hot dogs in the United States? You’d think a country that had something like turducken and deep fried ice cream would have had that covered by now. When I saw a recipe for these pluto pups on an Australian recipe website I knew they would be mine… beer battered hot dog goodness with a cute name to boot. Converting them to gluten-free was a bit trickier than I’d anticipated. The deep fried bananas that I made back in Indonesia were so great that I thought I’d be able to use rice flour only. I tried and ended up with a super crispy casing akin to an egg roll wrapper. Good, but not quite what I was looking for. Heat 1 Tablespoon of oil in a large skillet and fry up the hot dogs until cooked and/or browned. Transfer to a plate and blot of the oil with a paper towel (the grease will prevent the batter from sticking). Combine the rice flour, potato starch, salt and baking powder in a large bowl. Add the egg and just enough beer to make a thick batter, just a little bit thicker than pancake batter. Whisk until smooth. In a saucepan wide enough to fit the hot dogs, heat the oil to 350 degrees. Dip one of the hot dogs into the batter to evenly coat. Drop into the oil and fry until golden (you can fry two at a time). Remove to a plate lined with paper towels. Insert a wooden skewer into one of the ends of the hot dog and push until about halfway to two-thirds of the way through. Repeat with the remaining hot dogs. 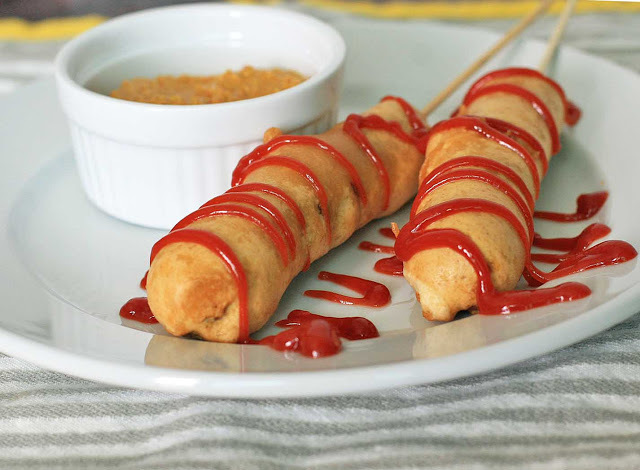 If the batter is not sticking well to the hot dogs, you can put some rice flour on a plate and roll the hot dogs in the rice flour prior to dipping in the batter. Place on a serving plate and serve with your favorite condiments.